By now we are all familiar with the economics of the recession. Save, Save, Save! So in the spirit of this new age of cost-cutting and prudence, this article will show you some simple ways to cut your gas costs. A new trend is influencing how people drive; it’s called ‘eco-driving’. In essence, this is driving in a way that will not only save you money but will also benefit the environment. In fact Britain’s RAC suggested that a few changes in your driving habits could slash up to 8% off your yearly gasoline costs; meaning that it could potentially save you around $200. Not a fortune, but in these dark days every little bit helps. It has long been claimed that reducing your overall speed will provide better fuel efficiency to your car. 55mph being the recommended highway speed as this is the speed that new cars are test driven at to analyze their fuel efficiency. However recently that view has came under some criticism and led Peter de Nayer (Green Car Guide) to assert that 40mph was indeed the best speed to cut your fuel expenditure. Furthermore, having the air conditioning turned off can also increase your fuel efficiency by up to 8%, believe it or not, so on occasion, open your windows instead. During Driver’s Ed, anticipation and observation are seen as key attributes necessary to successfully complete a lane change, but this strategy also proves to increase your vehicle’s fuel efficiency. How? By anticipating how the traffic is flowing you can eliminate any unnecessary braking or accelerating. Last but not least, you should switch off your engine completely if, for instance, you are stuck in a traffic jam or if you are at a red light you know will last for more than a couple minutes. Gas prices are fluctuating all the time and these days they seem to be staying up instead of coming down, so the fuel consumption of your car is important. By following the above tips, you will notice a difference in how far you can go on each tank. Another money saving tip is to skip out on the premium fuel. The type of fuel is advertised at an extra cost as it is said to increase your cars performance and longevity; unfortunately this may not be the case for yor vehicle. Unless you have a car that requires premium, just buy regular. If you look around you will often see some promotions for money off gas – generally in supermarkets. These usually offer you a few cents off each gallon in return for spending, say, $50 in their store. If you begin to shop at that store regularly then this could be a real money saver in the long run. Some chains will offer a loyalty scheme so it’s worth checking out some outlets that offer store credit or company money (ie: Canadian Tire Money). Paying by credit card can also give you a little extra back if it has a rewards plan. Performing one of these tips on its own might not save you a thousand dollars but if you combine them all then you will notice a difference in the amount you spend on gasoline. It is something we don’t always notice, however, say that you spend $30 per week on gas for commuting etc… this amounts to $1,500 a year. Don’t you want some of it back? It has been nearly a year since gas prices inched pass the $1.00/L mark before shooting up towards $1.43/L. As the price of crude oil has retreated from its highs this summer, the price of gasoline is finally starting to drop as well. Drivers in Ottawa woke up to gas at $0.984/L while Toronto had prices hovering just above a dollar at $1.05/L. On Wednesday morning at a small station on Montreal Road, gas was 98.7 cents a litre — about 30 cents lower than it had been at some stations this summer — and Rosemarie Dicaire was pumping it into her SUV to take advantage. As worldwide oil demand continues to drop, and the price of crude oil continues to slide we should see even more drops in gasoline price. I was actually getting used to the higher fuel prices and didn’t mind it as I noticed many people opted not to drive and began taking public transportation. The question remains on when these people will jump back to the driving world or if they have gotten used to taking public transit. Jazz Airline Removes Life Vests: Excessive Weight Reduction? Jazz Airlines, a regional carrier owned by Air Canada has taken extreme measures to save fuel on their flights by removing inflatable life vests. Aren’t these things mandatory you ask? Technically, no. Transport Canada regulates airline safety and states that airlines only require one floatation device per passenger when a flight is within 50 miles (80 kilometers) of shore. Each seat cushion on an airplane also serves as a floatation device. Infant and toddler sized inflatable life vests will still be available on board Jazz flights. I’m not sure how many life vests a typical plane carries or how much each one weighs but will this even save any significant amount of fuel? The airline has also stated that it is modifying some routes to ensure the plane remains within the 80 km limit off the shore. Wouldn’t this further negate the fuel savings? Soaring gas prices have led airlines to make changes to their daily operations but they have never been at the expense of passenger safety. It’s not clear how much weight would actually be saved by removing the vests, “but when you’re trying to save every bit of money you can to make the airline more productive, every bit counts,” Tom Hinton, a former top aviation official at the Transportation Safety Board, told the Toronto Star. This sort of obsessive weight reduction reminds me of people that replace their factory bolts with “light weight” titanium bolts for better performance when really a quick trip to the porcelain throne with a bottle of laxative will net better results. Next week we’ll hear about Air Canada removing a few rows of seats so they can offer “Standing room” tickets to save even more weight! Rising energy costs has resulted in behavior changes everywhere. Car buyers are looking at more fuel efficient models and some are changing the way they drive to save gas. Even airlines now are slowing down their planes to save fuel. Of course, the best way to save money is to stop driving cars completely and turning off all the lights and air conditioning systems in our homes and offices, a bit extreme but not practical. Or is it? This week the Utah State Government switched to a 4 day workweek. Instead of employees working 8 hours a day for 5 days a week, they now work 10 hours a day for 4 days a week. On Fridays; the lights stay off, the heating and air conditioning systems are off, and 17,000 state employees are off the road. State officials are estimating they will save nearly $3M in one year, about 20% of the total energy cost. Gov. Jon Huntsman is testing the new 4 day work week for one year, after which results on whether or not it is successful will be clear. The energy savings is impressive considering that only 1000 of the state’s 3000 buildings are affected by the new 4 day work week. 7,000 other state employees will still be working the standard 5 day work week. If this experiment proves to be successful, a full scale state government shutdown on Fridays would yield some significant savings. I personally would love to work a 4 day work week and enjoy all the long weekends! As gas prices across Canada slowly creep towards the $1.50 per liter mark (that’s about $5.65 US per gallon) more and more drivers are looking at ways to save gas. Some have turned to products that claim to help fuel economy but the truth is, they simply don’t work. However, here is a list of 10 ways to save gas that do work, and it wont cost you a thing! 1. Don’t drive aggressively – quick starts, hard stops and aggressive driving can increase fuel consumption by up to 37%. 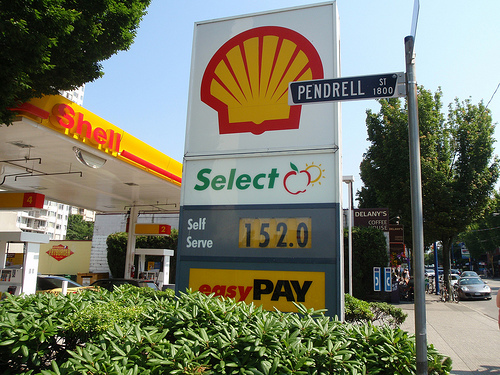 This is equivalent to paying $1.86 per liter of gas in Calgary at today’s average price of $1.36 per liter (In Richmond, BC where gas prices have hit $1.57 per liter, driving agressively makes the true cost of gas a whopping $2.14 per liter). It has been proven that a relaxed driver will use less fuel than an aggressive driver. 2. Drive at the posted speed limit – increasing your cruising speed from 100 km/h to 120 km/h will increase fuel consumption by about 20%. In addition to saving money on fuel, you’ll also eliminate the risk of getting a speeding ticket. 3. Don’t idle – when you let your vehicle idle longer than 10 seconds, you burn more fuel than you would restarting the engine. When you arrive at a major intersection with turning lanes, try turning off your car and restart it right before your light is about to change. 4. Drive only when you need to – leave your vehicle at home whenever possible by walking, biking, blading, carpooling or taking the bus to nearby locations. 5. Plan ahead – If you have to drive, plan the most fuel-efficient route in advance. If you can, try to avoid driving during the peak rush hour times to avoid traffic delays. 6. Use your vehicle’s air conditioner sparingly – using your air conditioner in stop-and-go traffic can increase fuel consumption by as much as 20%. Try opening the windows or fresh air vents to cool your vehicle. For highway driving, you’ll want to stick with the air conditioner as open windows will decrease fuel economy. 7. Measure the inflation level of your tires once a month. A single tire under-inflated by just 56 kPa (8psi) can increase your vehicle’s fuel consumption by 4%. Be sure to check tire pressure after the vehicle has been sitting for at least 4-5 hours. During normal driving conditions, the tire pressure will increase due to the heat. 8. Use cruise control – on dry, flat wide-open highways, use cruise control, to help improve fuel efficiency by maintaining an even speed. 9. Maintain your vehicle properly – a poorly maintained vehicle consumes more fuel, produces higher levels of emissions, requires expensive repairs, and has a low resale value. If you want to try some more extreme methods of saving gas, try hypermiling. 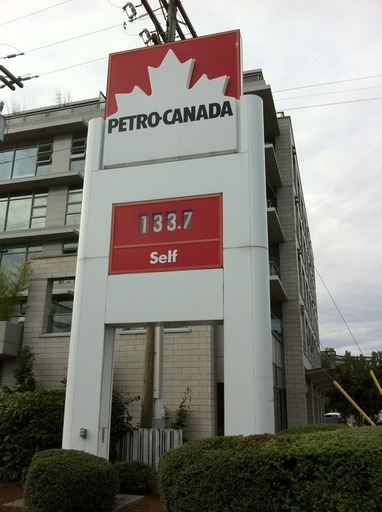 As the nation turned 141 on Canada Day, BC residents were dealt another blow in the ongoing saga of rising gas prices. BC’s new Carbon Tax took effect adding 2.34 cents to each liter of gasoline sold in the province. The new tax, coupled with rising world oil prices sent gas prices shooting up to $1.52 per liter of gas (Thats about $5.70 per gallon for our US readers). Although the new tax is expected to pull in over $1.8 Billion in the first three years, the money will not go into Government coffers. Instead, the money will be returned to tax payers in the form of corporate and personal income tax reductions. While individuals will be contributing only about one third of the carbon tax, they will receieve two thirds of the credit. Businesses on the other hand will contribute two thirds but will only see one third of the credit. All BC residents will also receieve a one time payout of $100. The bad news? The carbon tax rate will increase each year until 2012 when it will add 7.24 cents to every liter of gasoline. By then, hopefully more alternative fuel sources are available to lessen the demand for conventional fuel sources. Skyrocketing fuel costs have hit the airline industry hard this year prompting Air Canada to implement a fuel surcharge with WestJet following soon after. Air Canada is going one step further by implementing a $25 charge for that second piece of checked luggage. Now, airlines are going one step further and adopting a practice used in the automobile industry, called hypermiling. The basic premise of hypermiling is to save fuel by cutting back on excessive acceleration and cruising as much as possible. The more extreme techniques of hypermiling however would not work for airlines (747s tailgating another 747 to save jetfuel?). Westjet has started to relax on the throttle on many of its flights so if you thought that last flight took a bit longer than it should have, it probably did. Air Canada is also slowing down some of its flights to conserve fuel but its flights will only be one minute longer per hour of scheduled flight. In addition to easing up on the throttle, the airlines are also looking at reducing weight and reducing the amount of time the engines idle between actual flying time. Horizon Air has started to only use one propeller when the plane is taxiing. Airline hypermiling has reduced the amount of fuel used by over 8 million kilograms. I’m not sure how much a kilogram of jet fuel costs, but I’m willing to bet it is a significant saving. Fuel costs are the point where it is beginning to impact the masses. New car buyers are shopping for more fuel efficient cars and now even the airlines consider more fuel. Want To Save Gas? Just Relax! Oil recently hit an all time high of just under $140 per barrel and the price of gas did not take long to follow suit. Just this week the average price of gas across Canada shot up about $0.10 per liter in many regions. In Calgary it shot up about $0.08 per liter. As a result, many people are changing their car buying decisions opting instead for something a little less thirsty. Others turn to fuel saving tips like inflating tires to maximum pressure, coasting down hills, tailgating large trucks, rolling down windows instead of using the air conditioner, and filling up in the morning. The list of fuel saving tips is endless! Hypermilers take all these tips to the extreme and often get hybrid car like mileage in non hybrid vehicles. “Mythbusters” co-host Adam Savage has made a living debunking gas-saving myths on his popular Discovery channel show. The only thing he’s found that really saves gas? Relaxing. In an experiment that will air in an upcoming show, the “Mythbusters” team found that people who drive while they’re angry use 50 percent more gas than people who are relaxed. That’s right! 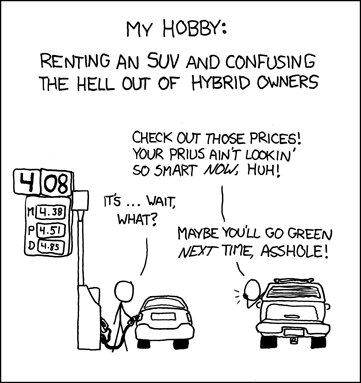 The dreaded “R word” that women hate to hear in arguments is something that will help you save gas. It all makes sense, when you’re stressed or angry you tend to drive faster. You floor it, slam on the brakes as you run into traffic, switch lanes, floor it again for a few seconds until you run out of room again, and repeat.